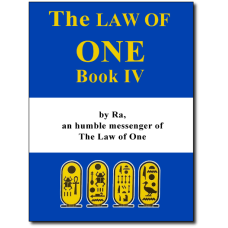 If you have enjoyed the first three books of The Law of One series, Book Four is also available. Book Four explores in great detail the archetypical mind which seems to be the framework provided by our sub–Logos to aid each of us in the evolution of mind, body, and spirit. Each of you is probably familiar with one or more of the systems of study which have attempted to codify this framework; that is, the tarot, astrology, and the Tree of Life or ritual magic. In Book Four we begin a study of the archetypical mind in relation to the tarot, which Ra gave to the Egyptians 11,000 years ago as a kind of blueprint for the study of the universal mind. Each portion of each tarot image holds a symbolic meaning that enhances this evolutionary process. In laying the foundation for a thorough study of the archetypical mind we have, of necessity, also uncovered information on the nature and purpose of the veil that we experience between the conscious and subconscious minds and the process of forgetting that occurs during each incarnation in our third–density experience. In Book Four the path of the adept becomes more clear as Ra elucidates the adept's use of experience to balance its energy centers and penetrate the veil of forgetting. Book Four contains Sessions #76 through #103.